Several years ago I decided that I would prepare a Christmas Eve dinner in keeping with our heritage. Our menu would consist of “Roast Beast”, Yorkshire pudding, Duchess Potatoes (which the Pioneer Woman has posted this week on her blog) and Steamed Carrot Pudding. My Grandmother (the same one that dipped chocolates) made THE best Steamed Carrot Pudding. We cannot go one single Christmas without her steamed pudding. Someday I will definitely post that recipe. 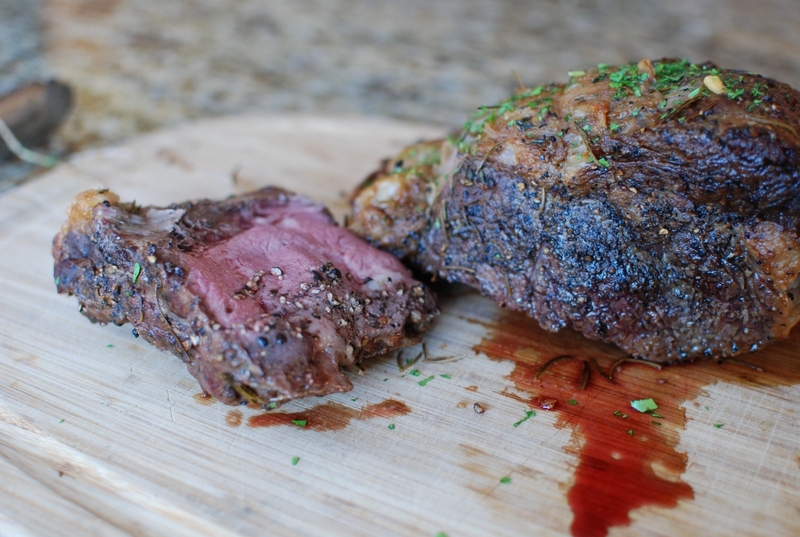 I have become rather fond of slow roasting Prime Rib. 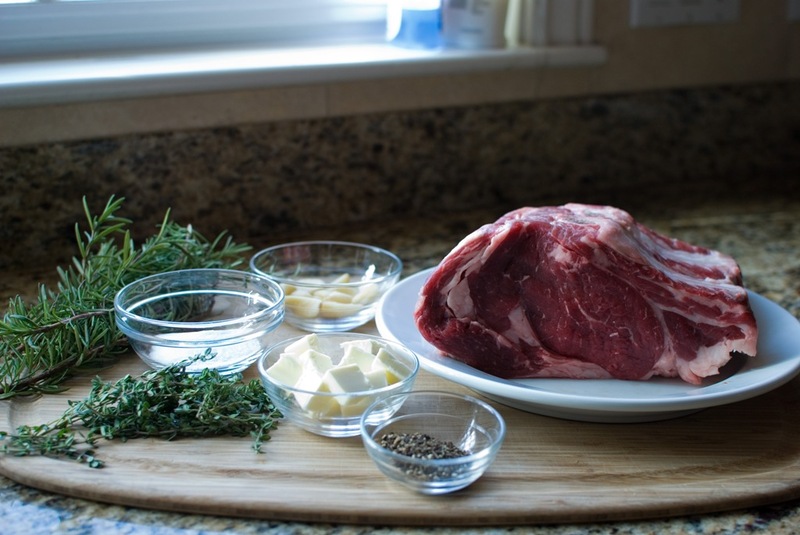 Three tips for a perfect rib roast: 1) bring the beef to room temperature before cooking, 2) baste often and 3) let it rest before carving. 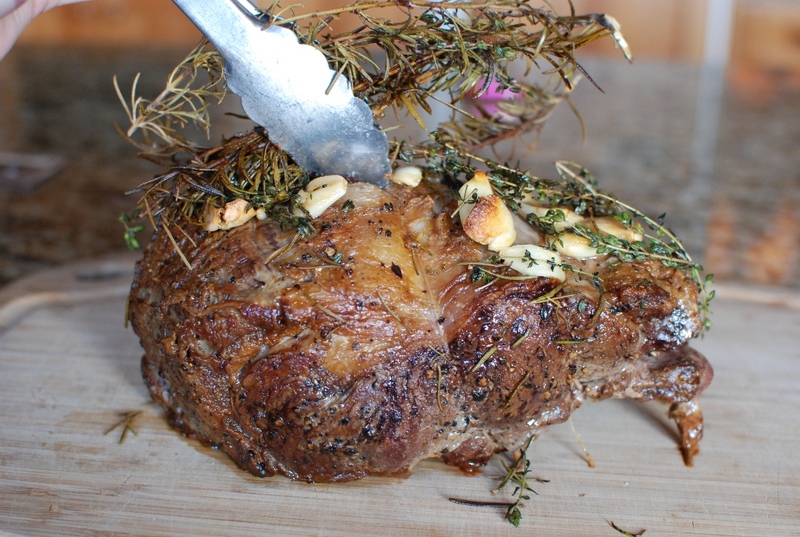 You will need a 3-bone roast (about 6 lbs), 3 tablespoons of fleur de sel or other flaky sea salt (kosher works), 1 1/2 tablespoons coarsely cracked pepper, 1 tablespoon of olive oil, 8-10 sprigs fresh rosemary, 8-10 sprigs, fresh thyme, 10 medium cloves garlic (smashed), 3 tablespoons unsalted butter, cut into 1/2-inch cubes. 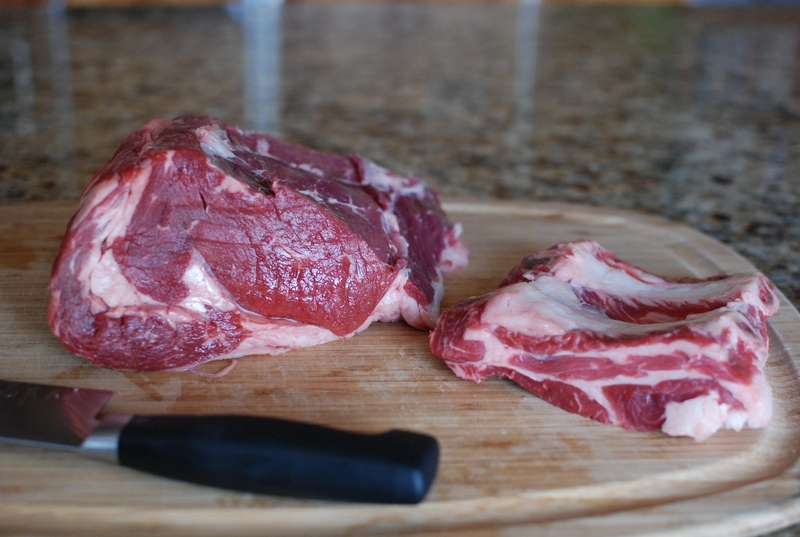 Take the beef out of the refrigerator for 2-3 hours before cooking so it can come to room temperature. I like to cut the ribs off the roast. 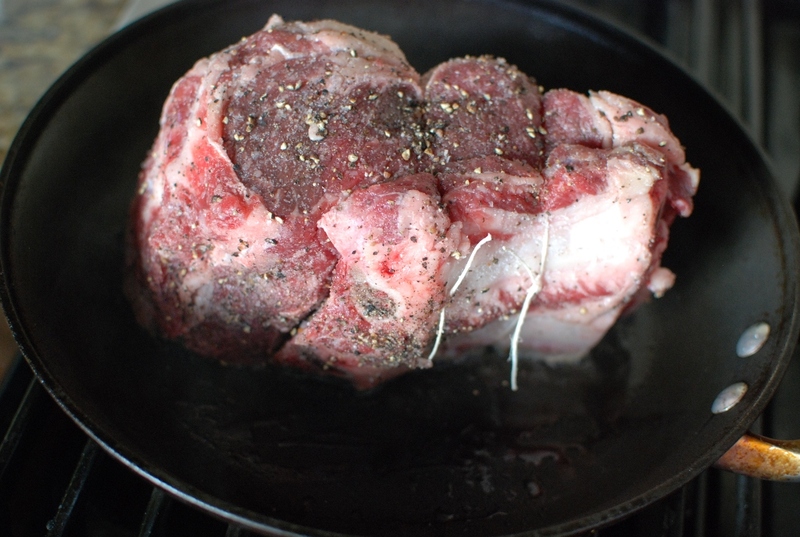 Then I re-tie it onto the roast. I know it seems stupid, but it really makes carving time so simple. I know you are asking, “why doesn’t she just by a boneless Prime Rib Roast. Well, the ribs serve as a rack for the meat during roasting. It actually works quite well. Oh, by the way, if you haven’t noticed I am using a 2 rib roast. I just have four for dinner and I don’t want a ton of left overs. Rub the meat all over with the salt. Rub with coarse ground pepper. 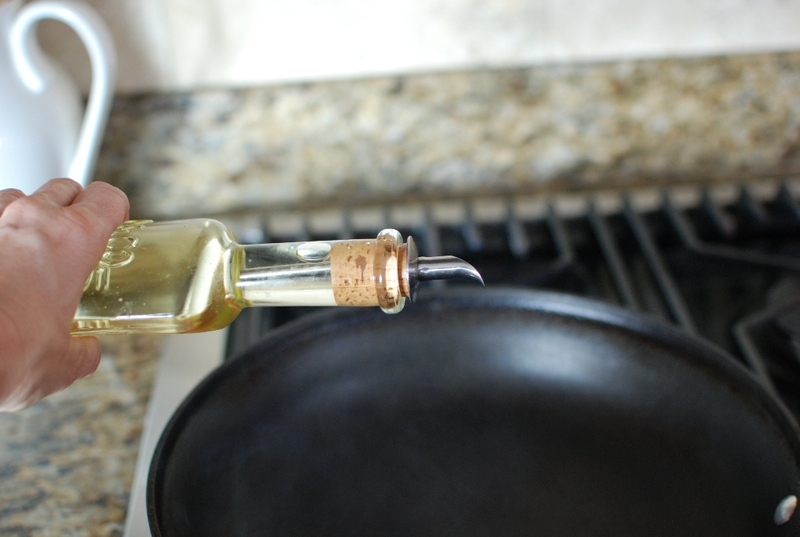 Heat a skillet over high heat for one minute then add 1 tablespoon of olive oil. If you have a exhaust fan, now would be a good time to turn it on. Place the meat in the hot skillet and brown on all sides. Make sure to brown the tops, sides…everywhere you can. 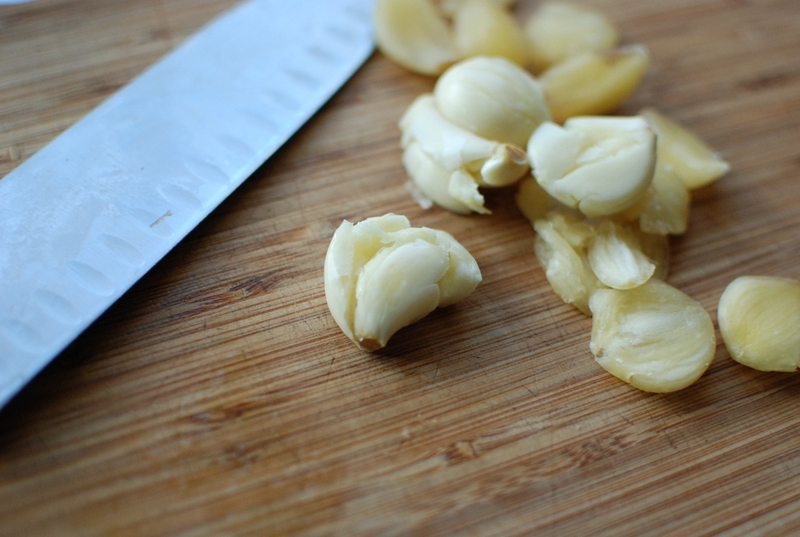 Smash 10 cloves garlic with a knife…or whatever it is you use to smash garlic. Place the meat in a roasting pan with the ribs down to serve as a rack. You can also use a rack if you prefer. 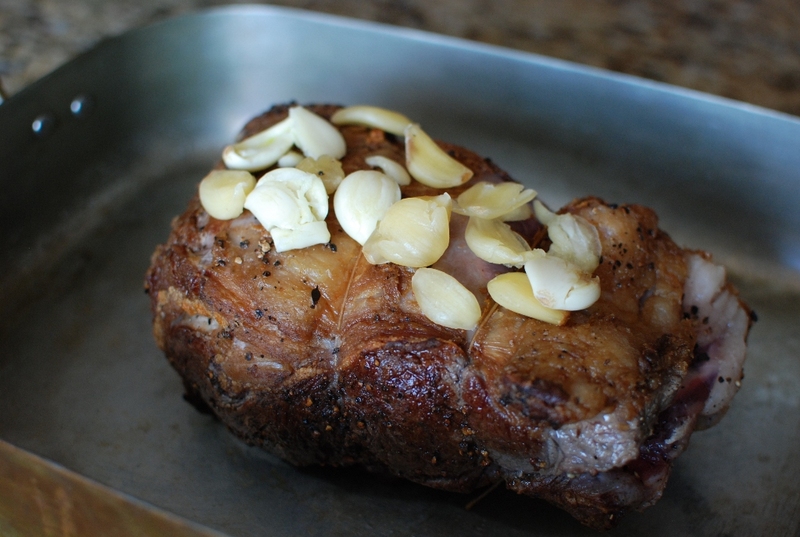 Place the smashed garlic on top of the roast. 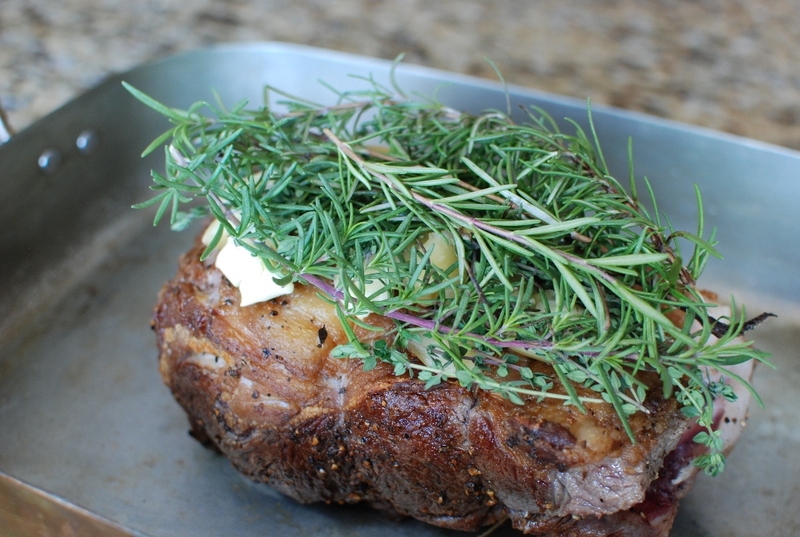 Top with the sprigs of fresh thyme. 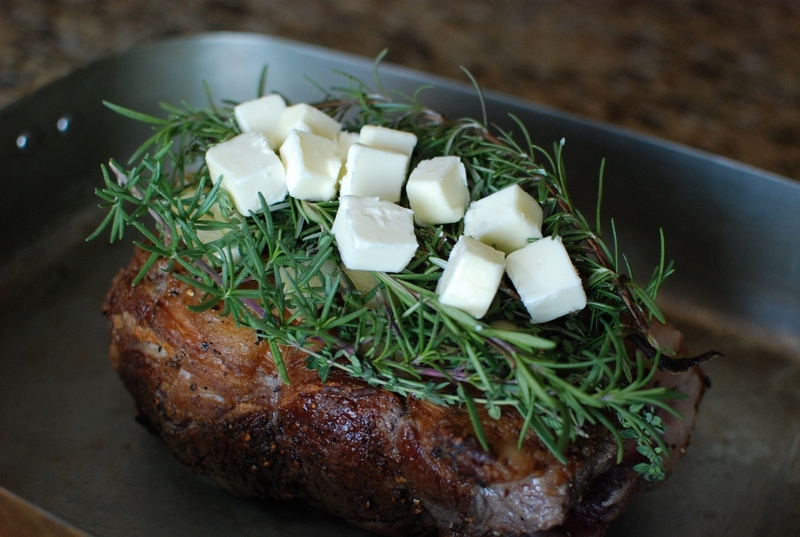 Place the butter on top of the rosemary. When the butter melts it creates rich drippings for basting. 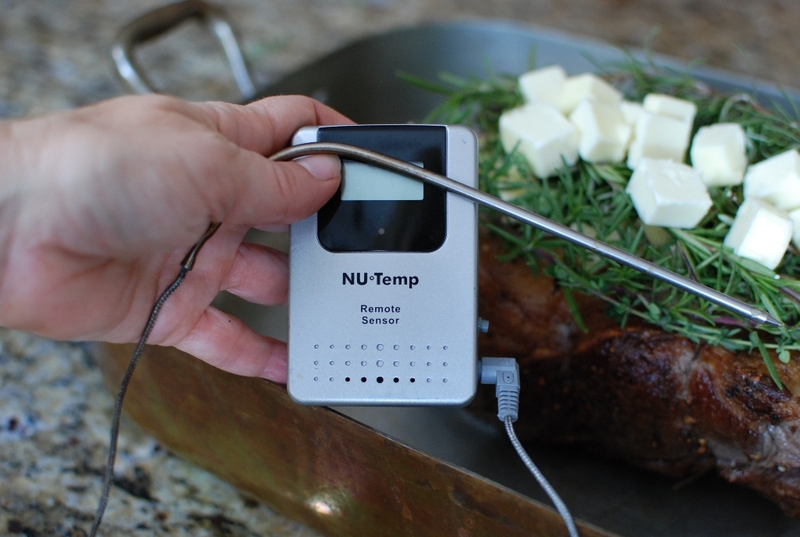 Meat thermometers are very handy to have. If you have a one of these dandy tools, insert it into the center of the meat. Make sure the thermometer is not touching the bone. Place in the preheated oven and roast for about 2 to 2 1/2 hours. Baste the meat every 30 minutes with the drippings from the meat. Use a bulb baster or a large spoon. When the meat has reached your desired temperature remove from the oven. There is a chart below. Remove the herbs and garlic. ***THIS IS IMPORTANT*** LET THE MEAT REST FOR 15 MINUTES BEFORE CUTTING! This will keep the juices inside the meat instead of running our all over the cutting board. When you are ready to carve the meat, cut the strings. Remove the ribs. There is someone generally around that loves to chew on the ribs. Sometimes I just save them for a fabulous beef soup bone. Carve. The end pieces are generally the most well done. They also have all the flavor of the seasonings. There are only two end pieces, which leaves for a discussion as to who GETS them. I cooked my roast to 150 degrees for a medium doneness. I don’t think that’s a proper term. I am now left with perfect drippings for the Yorkshire pudding…that’s another post. 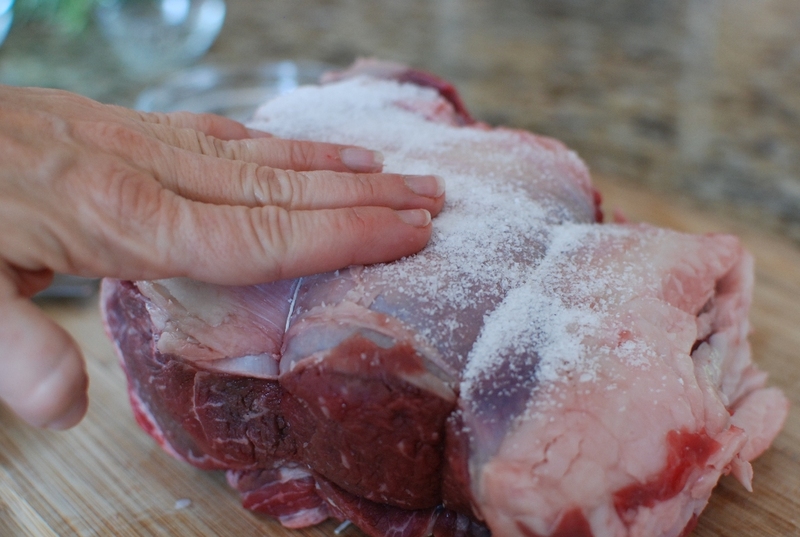 Take the beef out of the refrigerator 2 hours before cooking so it can come to room temperature. 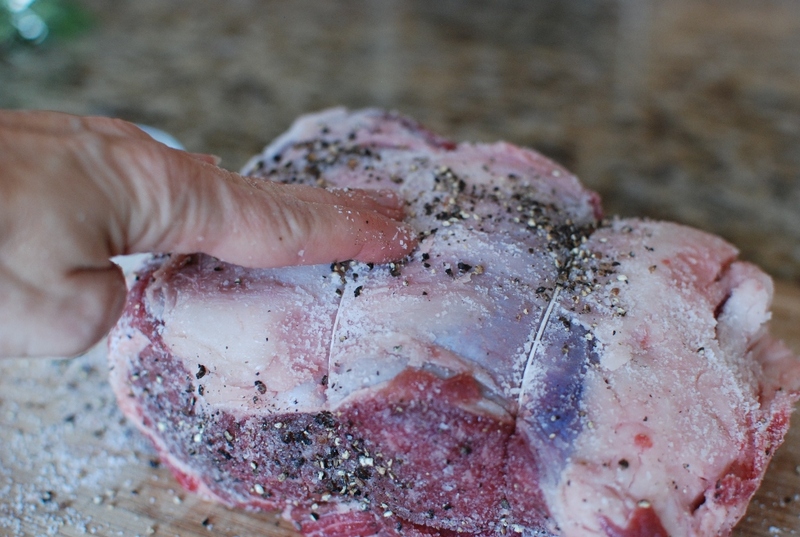 After 30 minutes, season the meat on all sides with the kosher salt and cracked black pepper. Position rack in the center of the oven and heat oven to 325 degrees. Turn on the exhaust fan. Heat a 12-inch skillet over high heat for 1 minute. Swirl in the olive oil and, when the oil puts off it first wisp of smoke, place the beef in the pan, and sear it on all the outer sides ( Not the cut sides) until well browned, 6 to 8 minutes total. Use a set of tongs to flip the beef; be careful of splattering oil. 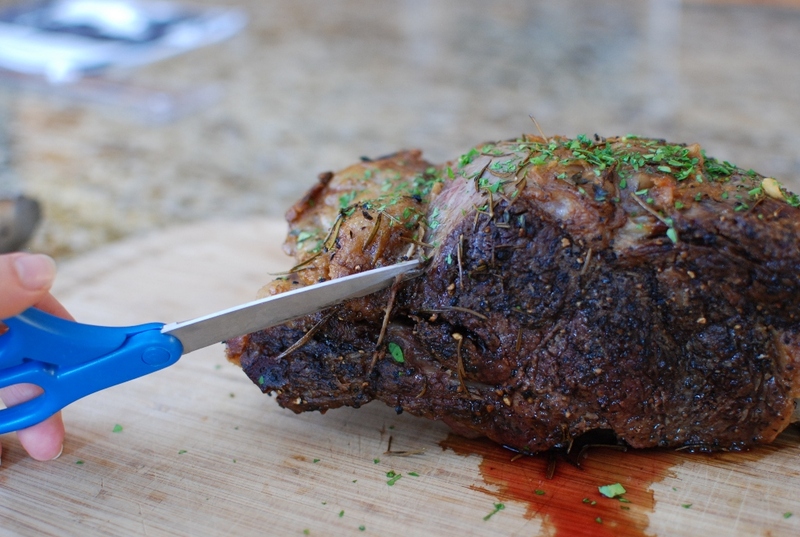 With the two sets of tongs, transfer the beef, bone side down, to a roasting rack set in a small roasting pan. 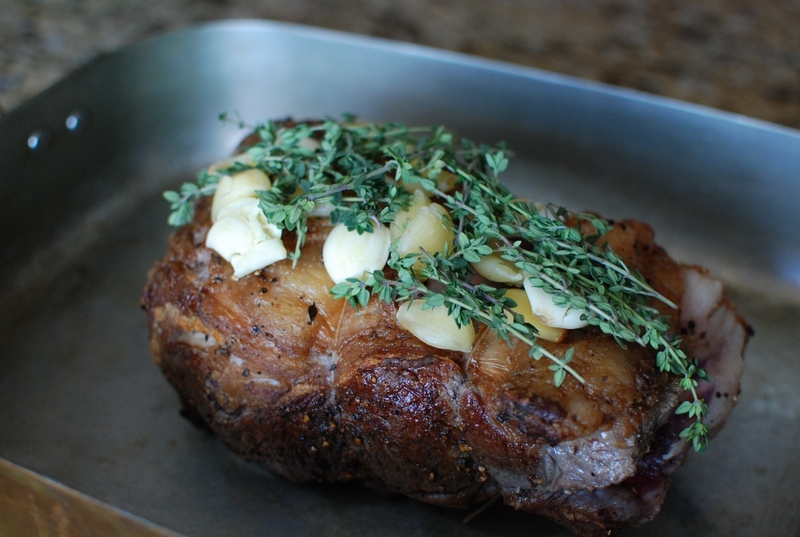 Arrange the rosemary, thyme, garlic, and butter evenly on top. 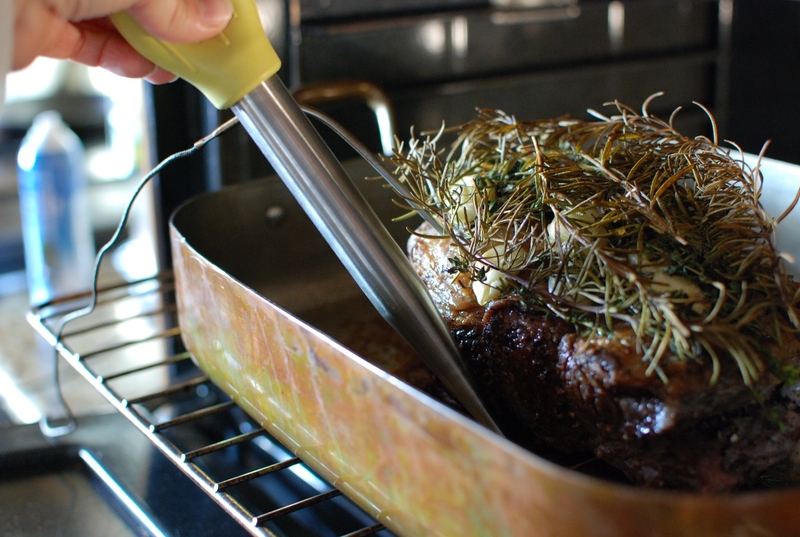 Roast the beef, basting every 30 minutes with a bulb baster, until a thermometer inserted into the center reads 120 – 125 degrees for rare, about 2 hours. 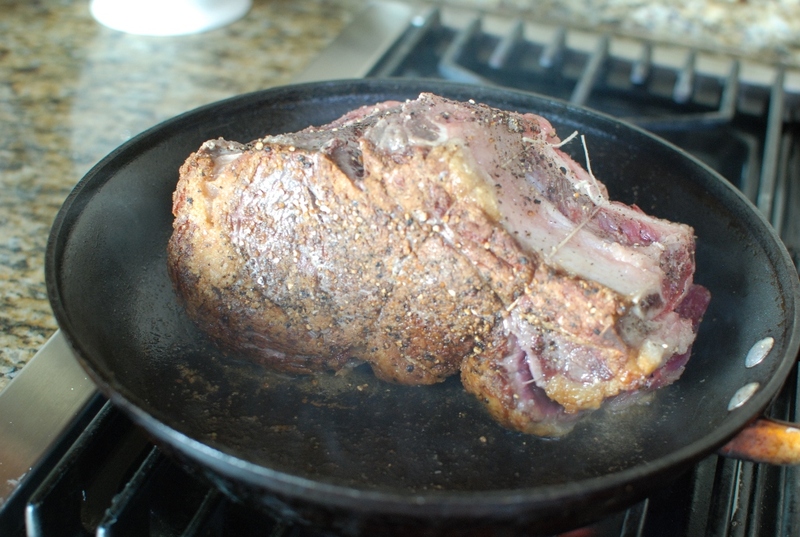 Cook 130 to 135 degrees for medium-rare (about 2 ½ hours). 140 to 145 for medium (about 2 ½ hours). Let the meat rest at least 15 minutes before carving. I hope you have a fabulous celebration. I used these instructions again (this is the second Prime Rib I have ever made) and it turned out better than the first. Thank you again. Cheers. Thanks, Mark. I'm so glad you had success. Now you have me craving Prime Rib. Wow! It is so attractive. Nice to enjoy it. Janet Baton, I hope you are still reading the comments. This is my first prime rib roast to prepare. OMG it was better than most restaurants. I used a digital thermometer and took it out of the over at 130 degrees and let it rest until the roast reached 140 degrees for a medium. To set the scene, I had a bottle of great Amarone wine (to those who didn't like this recipe, I am not drunk –lol) and a blooming Meyer lemon tree next to the dining room table. It was a grand evening. I will be using this recipe again and thank you every time for posting it. Sorry, Mark, I just had to post both of your comments. Ha ha there will always be haters…booo. Love the comment. Janet Barton. I hope you still read the comments. This is my first prime rib to roast. I followed your directions and OMG!!! It was better than most restaurants. I used a digital thermometer and pulled it out of the oven at 130 degrees and let it set until it was 140 degrees for medium. I plan using some of the leftovers for a beef stew. To set the scene, I had a great bottle of Amarone wine and next to the dinner table was a blooming Meyor lemon tree. Just a perfect evening. Everytime I use this recipe, I will thank you for posting it. You just made my day, Mark. Thank you so much. My mouth is watering right now. 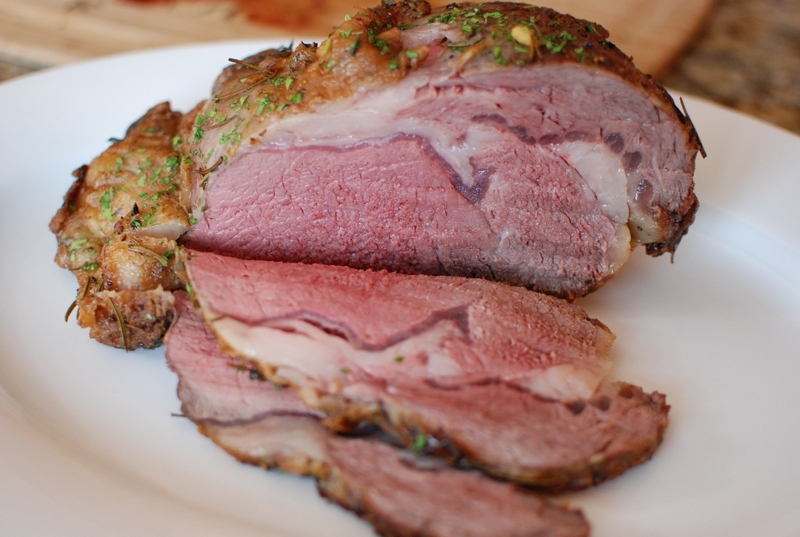 I can't wait for Christmas dinner and I hope my rib roast turns out as well as yours. Unfortunately I'll be sitting next to a cold window watching the snow instead of enjoying lemon blossoms. Have a great holiday. Well, that’s the meal perfect for a grand holiday! That rib was obviously roasted to perfection. The color is rich on the outside, and juicy and flavorful on the inside. Now all you need is a glass of sauvignon blanc to begin a delightful feast. Thanks for sharing! Sad story. I'm sorry. 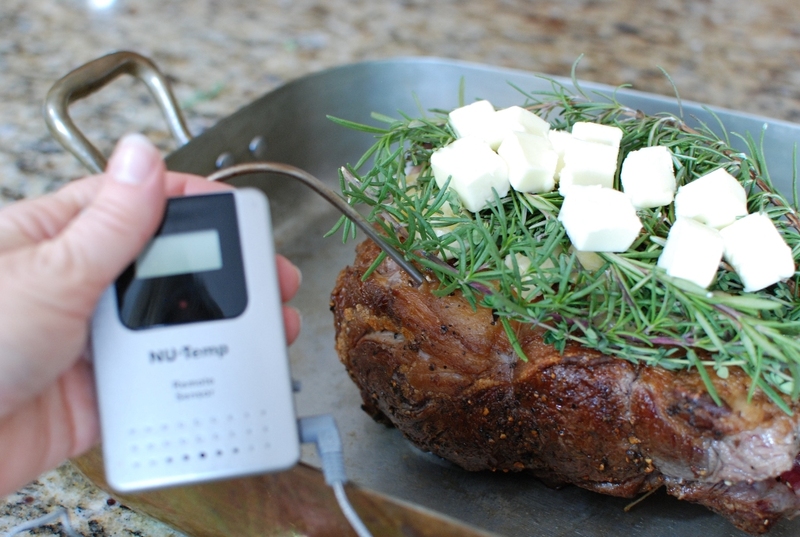 Next time get a meat thermometer and test for rare. 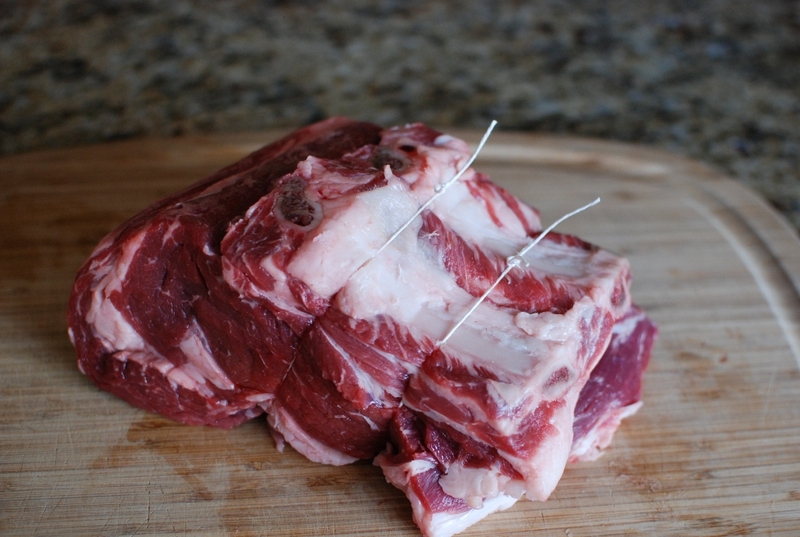 A 2 bone Angus rib joint came out overcooked using this recipe. In fairness its a bit too well done for my tastes in the photo but basically this recipe ruined a £50 joint. Gutted. why not marinate it and cook for 10 hours with 100 watts of electricity in a english slow cooker? the meat will be incredibly tender. do not lift the lid till 10 hrs are up. that is slow cooking. Wow. Now I have to go clean the drool off the keyboard. That looks fabulous. Merry Christmas to you Marie. Thank you! Oh my goodness. That looks fabulous! I can almost taste it! Merry Christmas!